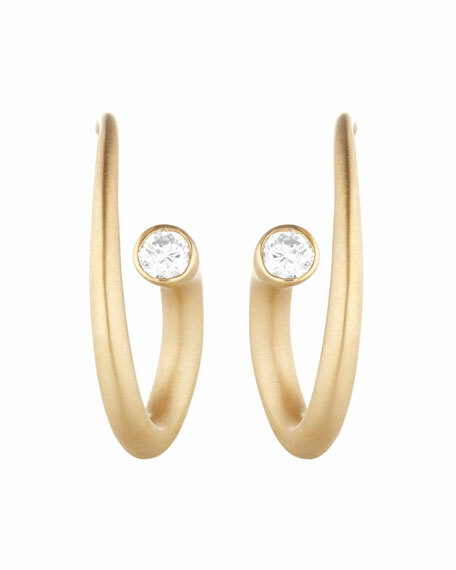 Carelle earrings from the Whirl Collection. Two round GH-VS diamonds at ends. Whirl Collection: Whirl transforms the City's energy and rhythm into chic essentials designed to navigate everyday twists and turns with an elevated sense of style and sophistication. Made in New York, Carelle blends cityinformed sophistication with nature's subtle forms for a modern-meets-masterpiece approach to luxury jewelry. Even its name, "car elle" French for Because of Herillustrates the driving force behind the artfully abundant, 18karat gold collections. From minimalist to magnificent, each design shares the inherent power of emphasizing the spirit, story, and individual style of its wearer. For in-store inquiries, use sku #2036082.